Today will mark one week since the eighth release order has been made for Egyptian blogger Mos'ad Suleiman Hassan (a.k.a. Mos'ad Abu Fagr); Despite that fact, Fagr remains locked at a police station in El Arish (North Sinai). Fagr, a Sinai activist and novelist has a blog called Wedna Ne3eesh (We Want to Live), where he writes about the demands and life of the Bedouins of Sinai, as well as the citizenship rights they seek. Abu Fagr was arrested on 26 December, 2007, following the Egyptian government's attempt to take over houses in Rafah and the demonstrations which succeeded them. The Public Prosecutor's Office charged Abu Fagr, among others, with inciting riots, resisting authorities, and assaulting civil servants on duty. Even though a court ordered the release of Abu Fagr, the Public Prosecutor in El Arish decided to detain him in on new and allegedly fabricated charges in February of 2008, including a possession of a weapon without permit and driving a car without a license. Since his arrest, the Sinai blogger was transferred into police custody and then prison. He was first kept in custody in El Arish for 15 days and then transferred to Ismailia, the Security Directorate of North Sinai, Rafah police station, and again to El Arish police station to investigate him on the new charges, then to Borg Al-Arab. Currently, Mos'ad Abu Fagar is in Al-Arish police station in Sinai, allowing his family to visit him frequently, according to his blog, which his wife continues to update. It describes the visit of the detained blogger's wife and daughter, Ranad. Ranad is visiting her dad everyday. It is weird anyway, that we know where Abu Fagr is detained, as they didn't use to reveal where he was. Ranad was asking me why Mos'ad doesn't go back home with us? And asking her dad: why don't you come back with us, as we are in Sinai, so it is natural that he returns home with us. She always wants to ask the guards to let us stay more in the visit, as the time for seeing Abu Fagr is 5 minutes not more! Ranad doesn't know that there is someone sitting in a seat somewhere who doesn't have any other task in life than to sigh her father's arrest warrant, and put in a jail, where half or even most the people there are being denied justice even though they are downtrodden Egyptians. 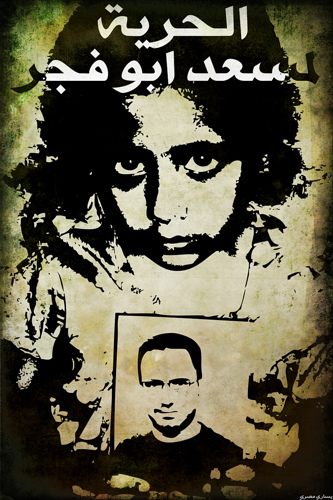 Ranad's face was the main element of the solidarity Campaign with the Sinai blogger. Her photo holding a picture of her father, or a banner reading “I want to have my Dad back” were spread over the Egyptian blogsphere.